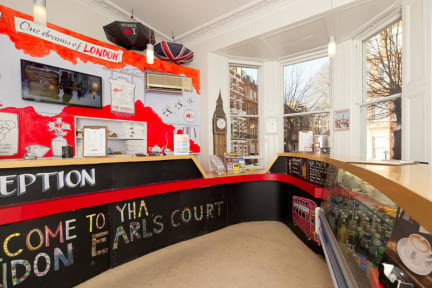 YHA London Earls Court is a busy 24-hr hostel with easy access to Heathrow and Gatwick. Just a short walk to the Exhibition Centre and tube station, this makes it ideal for seeing what the whole city has to offer. Our modern facilities in a Victorian building provide a convenient base, whether you're in London to explore its attractions or looking for a stop-over while you attend a gig or event at the nearby Olympia and Earls Court exhibition centre's. This cosmopolitan area of west London is close to Kensington Gardens, Hyde Park, The Natural History Museum, The Royal Albert Hall and The Science Museum. Great location, very close to the local restaurants and pubs:) We stayed in the private room so that was great- please make sure you take ear plugs because the walls are quite thin:) otherwise very safe, clean, warm. Great service :) we will definitely come back. I found it a good hostel. The facilities were clean and the atmosphere was nice, quite tranquil, but it wasn’t the typical hostel sphere, it was more of a familiar hostel (I don’t think I’d choose it if I was backpacking and wanted to meet new people). Everyone minded their own business and didn’t quite care about other people. It’s near Earl’s Court tube station, which is extremely handy, and it’s a nice neighbourhood. 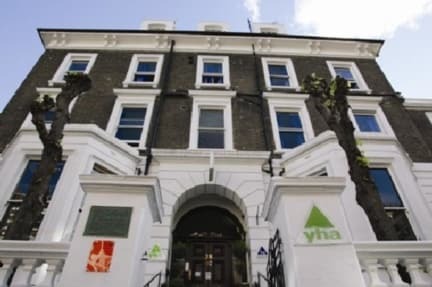 We enjoyed our stay at the YHA London Earls Court. The facilities were nice and the location was perfect: on a nice quiet street, but just a few blocks from the underground. Easy access to Heathrow. The only issue was that the WIFI was down the whole time we were there (from evening to the next morning), which was problematic as I was needing to make travel plans and let my family know that I had arrived safe at my destination. This is a good place to stay if you know what you're getting into. The staff was friendly and helpful. They were kind to stow our luggage both before and after checking in. Everything was clean. The bathrooms are incredibly small. You can practically wash your hands from the toilet and the sink is tiny, tiny. About a 5 minute walk from a tube station. Nice having lockers in room, but bring your own lock. The front door always seemed to be unlocked, even at night, so that wasn't very secure. Big, quite institutional hostel. Well located for a quick run out the the airport. Helpful staff. Squeaky beds. I left early for the airport. Awful WiFi, that demands tons of personal information to let you use it. Even then, it didn't work on my phone. I was they ran their own router with their own password,\; that is so much easier and more reliable. Well located hostel with friendly staff. Unfortunately the basement floor was rather a noice trap and every little movement outside our room was disproportinately loud and made for a disturbed nights sleep. The pillows need updating and there was an odd smell from our sink when we ran the tap which we mentioned to the staff but they didn't really have a solution and the hostel was fully booked so we couldn't move rooms.